Politics / Signs of the Apocalypse / Tech It's Election Day. Will San Francisco Survive? There's a lot of stake in today's municipal election. San Francisco voters will decide whether or not to fund a major housing bond, whether or not to approve a major new development on the site of the San Francisco Giants' massive surface parking lot, and whether to return Aaron Peskin to the Board of Supervisors or give a stamp of approval to Mayor Ed Lee's appointee, Julie Christensen. Oh and also, there's the thing about the Taliban taking over San Francisco and subjecting us all to sharia law. Or something. Rhetoric from both sides of the Proposition F fight over strict regulations on short-term rentals has gotten more than a tad heated. A helpful fact check from San Francisco Magazine points out the many ways that both sides have been exaggerating their cases, if not outright lying about the implications of the proposed legislation. But SF Mag sadly left out the most bombastic of the No on Prop. F side's claims, which is that the passage of Prop. F will place San Francisco under the thumb of an oppressive, authoritarian dictatorship. Or something. In order to enforce restrictions, Prop F would require hosts, along with websites, to report their booking data—the same way any business does. Patrick Hannan, who represents the No on Prop F campaign, says he is disturbed by that. 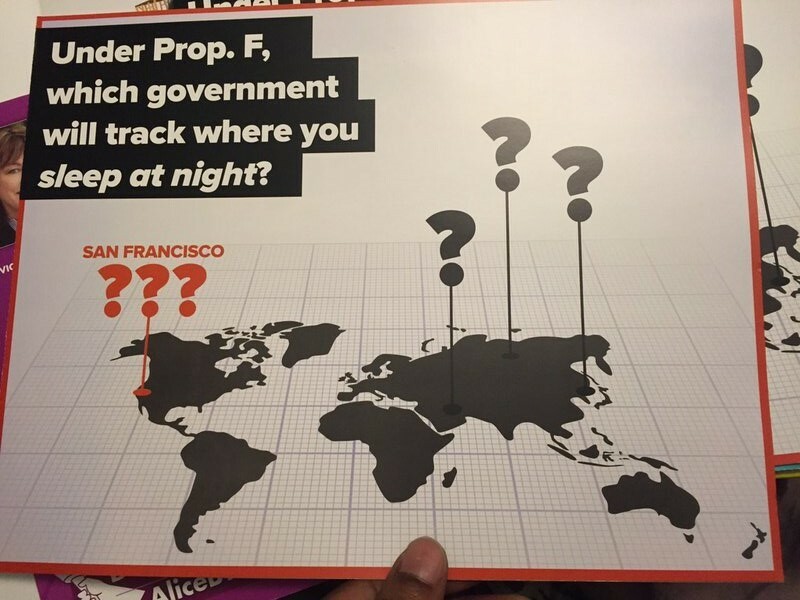 "Under Prop F, San Francisco will be the only government in the world tracking where you sleep at night. Not Syria, not North Korea, not the Taliban, San Francisco." The campaign also invested in mailers that ominously compare San Francisco to North Korea, Siberia (? ), and somewhere in the Middle East (Saudi Arabia maybe? Afghanistan? Does it matter?). “No one is the world requires you to actually register with the government the number of nights that you’re sleeping in your own bed,” Lehane says, which he described as draconian. Even Taliban and ISIS don’t go to such lengths in the Middle East, he said. This is scary stuff, and yet San Franciscans seem oddly sanguine about our future dictatorial overlord, the San Francisco Planning Department. A highly scientific poll of people who were looking at my Twitter feed at 7:55 AM this morning shows an electorate at peace with government regulation a total police state. We won't know whether $8.3 million has thwarted the axis of evil until tomorrow, but in the meantime, you can find your polling place here.